Welcome to our complete guide to the Schnug dog! We’re taking a close and candid look at Schnauzer Pug mix personality, and what they’re like as pets. This includes what to look for in Schnauzer puppies, how much exercise they’ll need, and what their health is likely to be like. There are hundreds of dog breeds out there, each with their own sets of attributes – both positive and negative. We believe that it’s important for prospective owners of dogs to be fully aware of all the pros and cons of any pup they are considering. Today, we will take a close look at the Pug Schnauzer mix, otherwise known as the Schnug. An adorable, admittedly odd looking dog, the Schnug is gaining in popularity, and winning the hearts of dog owners worldwide. But is the Schnug a good breed to own? Let’s find out! Schnauzer x Pug – Just Another Designer Dog? First and foremost, we must address the elephant in the room – the controversy surrounding so-called “designer dogs”, or first generation mixes. There is an ongoing debate in the dog owner community. Some believe that designer dogs like the Schnug are unethical or too unpredictable. 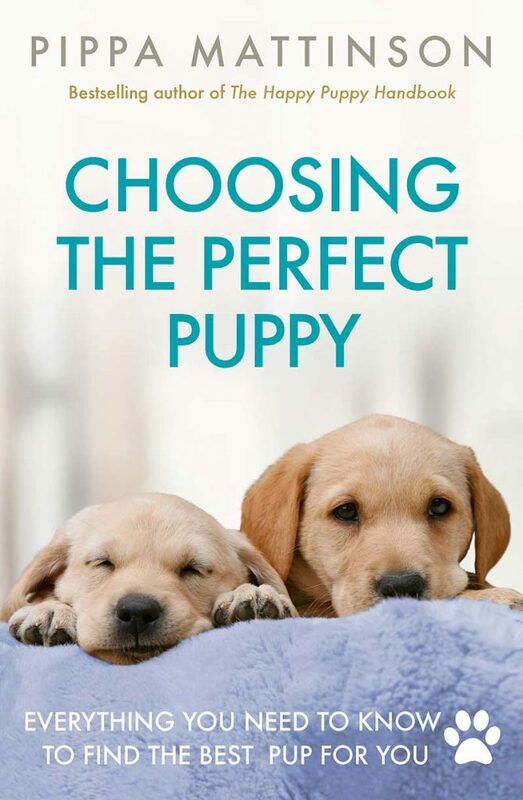 Some claim that inexperienced breeders are “playing God” when they develop new crossbreeds, and the puppies are likely to end up in a rescue shelter when the owner is disappointed with the result. Others love mixed-breed dogs and designer dogs, on the basis that they help to eliminate some of the common health issues associated with purebreds. Evidence of hybrid vigor in crossbreed dogs indicates that they are indeed on the path to longer, happier lives. Ultimately, no side has been proven right or wrong. Designer dogs have pros and cons, as do purebred dogs. The battle of purebred vs mutt is likely to go on for some time. Wherever you stand on the issue, we always encourage our readers to have an open mind on the issue. When we talk about a Schnug, we usually mean a Miniature Schnauzer cross Pug. Of the three Schnauzer types, Miniature Schnauzers are closest in size to Pugs, which makes them the most suitable for crossbreeding. With any crossbreeds like the Schnauzer cross Pug, there’s never any guarantee which traits a puppy will take from each of its parents. 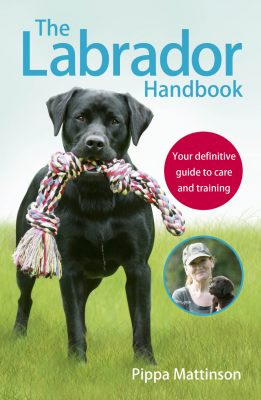 So you need to know about both breeds, and be prepared to embrace the unpredictability. This includes any combination of the physical qualities, temperaments, exercise needs and health problems of each parent. You could get a Schnug that’s mostly Pug, or mostly Schnauzer – or anywhere in between! So let’s learn more about these two breeds now – starting with their history! The Pug dog is an ancient breed with a history dating back over 2,000 years. It’s thought to have originated in China, where ancient Chinese Emperors had an affinity for devoted companion breeds like the Pug, Shih Tzu and Pekingese. Up until the 1500s, Pugs were rare and exceedingly hard for non-royalty to acquire. They were passed down within royal families, and occasionally given as gifts. Dutch traders eventually brought the breed to Europe, where it quickly gained popularity. Today, Pugs are rather popular, ranking in the top 40 most popular breeds on the AKC Breed Popularity list. The Miniature Schnauzer is another breed with a long history. The breed is thought to have originated in Germany as far back as the 1400’s. The Miniature was bred down from the Standard Schnauzer with the aim of creating an ideal breed for hunting rats. The Miniature Schnauzer fit this role perfectly, quickly becoming a popular choice for European farmers seeking a barnyard ratting dog. Today, the Miniature Schnauzer is even more popular than the Pug, consistently ranking in the top 20 most popular breeds. The Schnug dog is thought to have originated in the United States. The exact date of origin is unknown, but it’s a fairly young crossbreed compared to, say, the better known Labradoodle or Cockerpoo. Since the Miniature Schnauzer Pug mix is not very popular yet, there are lots of things we don’t know for sure about them yet, as you’ll see! Like any first generation cross, there can be a lot of physical variation among Schnug dogs – even between brothers and sister from the same litter! Bred from two small breeds, the Schnug is predictably small though. A full grown Schnug will usually be 10 to 14 inches tall, with a weight between 15 and 24 pounds or so. Schnugs are typically fairly long (from head to tail) yet short (from shoulders to floor). They can have somewhat of a boxy look, with a head that seems just a bit too large for their body. The shape of their face will vary depending on which breed comes through stronger. They can have the short, pointed muzzle of the Schnauzer, or the flat face of the Pug – or anywhere in between. Schnugs often take on the bearded face of the Schnauzer and many have large, prominent eyes. Their tales often resemble the Pug dog’s tail, curling up and over the back of the body, but that isn’t guaranteed. Schnugs are often described as a relatively high energy breed – like their Schnauzer parents – but not hyperactive. They enjoy walks and plenty of exercise. The Schnauzer cross Pug breed is usually a happy, social and curious dog. They have a bit of a mischievous streak, as well. They are typically intelligent and eager to please their owners, although like both their parents they can have a stubborn side at times. 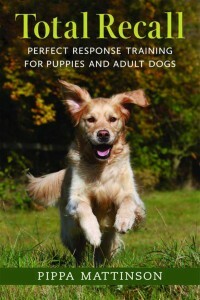 To get the best out of training them, you’ll need to come armed with lots of positive reinforcement techniques, and plenty of patience. Schnugs are generally good with other dogs and human friends alike, although they may take a bit of time to warm up to strangers. 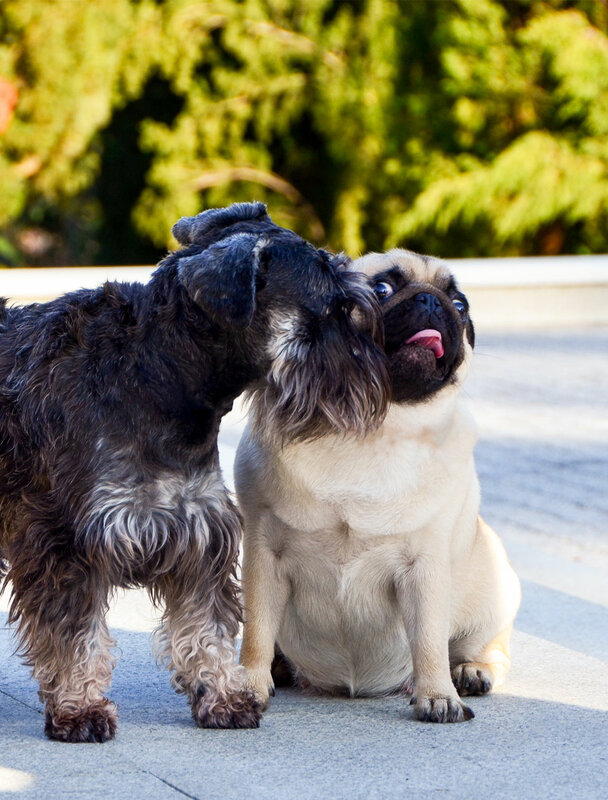 The Schnauzer Pug mix is a social breed and loves to be around their human. They can suffer from separation anxiety like Pugs, so this might not be the best breed to choose if you are out of the house for long periods of time. The Schnug usually has a medium-length coat that’s relatively straight, except around the face where it may be more curly or wispy. Coat coloring can vary. Shades of grey, cream, white and light brown are most common, but other colors like black and red are possible. Schnugs will often sport a bearded muzzle, which is typically a darker color than the rest of their coat. The Schnug is a moderate maintenance breed, requiring at least twice-weekly brushing to maintain coat health. They do shed frequently, although their relatively small size and short coat means that shed hair won’t accumulate very fast. Nails should be clipped once a month or so. Ears should also be checked regularly and cleaned, if necessary. You should also brush your dog’s teeth at least once a week to maintain dental health. If you get your companion as a puppy, this is the ideal time to establish regular grooming routines and get your dog used to the process. It can be difficult to introduce new grooming methods later in life as the dog may learn to dislike the process. The Schnauzer Pug mix can suffer from a variety of health problems. There are few hard and fast ways to really predict what issues your pup will develop, but it’s a good idea to be aware of the potential issues you are most likely to face. As with any mixed breed, the Schnug can inherit a predisposition to illnesses associated with either parent breed. Thus, one should look at the potential for health problems in both the Pug dog and the Miniature Schnauzer in order to get a better idea of what to look out for in a Schnug cross. Some common health issues of the Pug include Pug dog encephalitis (PDE), brachycephaly, hip dysplasia, elongated palate, Legg-Perthes disease, patellar luxation, entropion, obesity, and skin infections. On the Schnauzer side, health concerns include mycobacterium avium infection, eye issues including cataracts and retinal dysplasia, allergies, and Schnauzer comedo syndrome. In general, Schnauzers tend to be healthier dogs than Pugs. That’s because Pugs have been bred for a very extreme physical appearance, with a very brachycephalic (flattened) face. Sadly, this frequently results in difficulty eating, breathing, and controlling their temperature, as well as eye and dental problems. This leads some to believe that a crossbred Schnug may be healthier than a purebred Pug dog – but there are no definitive studies to prove that theory. Arguably it also unfairly compromises the robust Miniature Schnauzer with deformities and health problems they wouldn’t otherwise have suffered. The primary concerns for Schnug owners include breathing problems, eye problems and joint problems. Pugs and Schnauzers being used for breeding should have a vet check prior to mating, including a full eye exam and hip and knee assessment. A good breeder will happily share the results of this with you, talk frankly about the health concerns facing Schnugs, and how they try to protect their puppies. This is a lively, energetic dog that enjoys lots of walks and plenty of playtime. They have a moderate to high energy level. Their small size means that they don’t necessarily need very long walks, but frequent outings at least twice a day are ideal. Schnugs are playful little dogs, but they aren’t hyperactive. They enjoy playing with other dogs and their owners, although you will often find them entertaining themselves, as well. Their energy reserves can become a problem for Schnug puppies who inherit a Schnauzer’s love of activity but the brachycephalic features of a Pug. For these pups, their instinct to work hard is at odds with their physical ability to do so, which can be distressing, frustrating, and even dangerous. 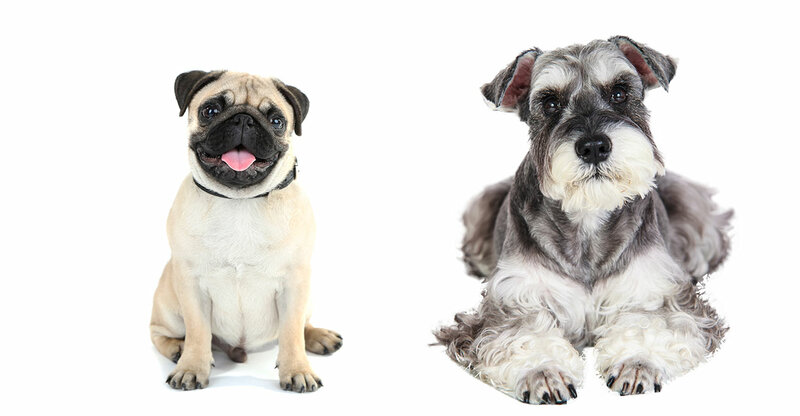 The Schnauzer Pug cross could live happily with a variety of owners. But since every first generation crossbreed is a genetic lottery, instead you need to be an owner who could live happily with a variety of dogs. Specifically, would you be happy with a Pug? And would you be happy with a Miniature Schnauzer? If you’re counting on avoiding a specific trait of either breed, doing so by getting a Schnug might not be a wise gamble. If you could happily set up home with either, but you’re rightly put off by the health problems facing Pugs, then a Schnug might solve your dilemma. Despite being intelligent, Schnugs inherit an independent streak and a short attention span from both parents, which means they are not among the easiest dogs to train. 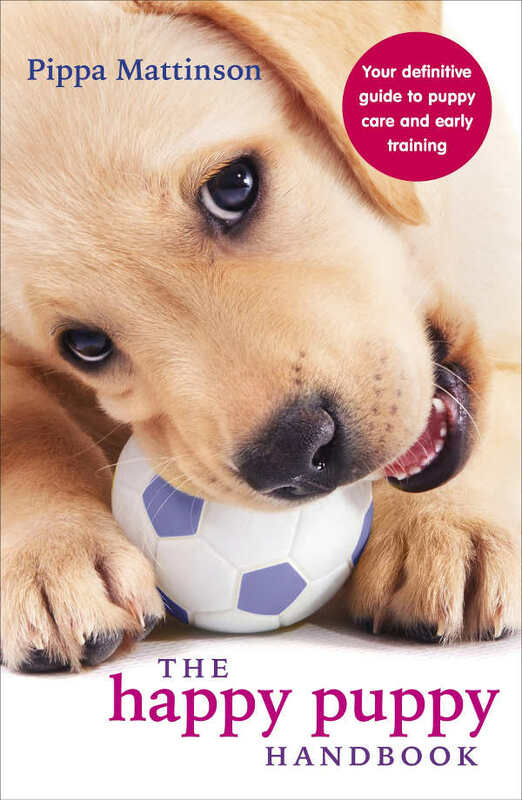 If you don’t have the time or inclination for a lifelong commitment to training and reinforcing good behavior, the Schnug might not be a good match for you. If you’re still interested though, where can you find your Schnug puppy? Pug and Schnauzer mix puppies can be challenging to find in many areas. The breed is relatively new and although their popularity is on the rise, numbers are still small. Thus, it’s unlikely you’d find a Schnug in a rescue situation, and you’ll probably have to seek out a Schnug breeder in order to find your pup. When looking for Schnug breeders, it’s important to do your research. Selecting a reputable, experienced breeder is vital as it improves your chances of getting a healthy, happy dog. Ensure that the Pug parent has wide open nostrils that have never required surgery. That they don’t snore or sleep sitting up, and that they have at least some extended muzzle. To locate a breeder, you can search online to find a local source. Be prepared to join a waiting list. In fact be wary of breeders who always have litters available – this is a big alarm bell that you’re dealing with a puppy farm. Is a Schnug Right For Me? The Schnug is a cross between two of our most popular small companion dogs. This little mix is likely to be a playful and personable member of your family. Since they’re small and don’t need hours of exercise, they make good apartment dwellers. But they still need lots of games and training, and they are prone to separation anxiety, so they’re best suited to owners with lots of time to commit to them. When looking for a new dog, you should first and foremost find a good, reputable breeder in your area, who is passionate about the health and welfare of their puppies. After that, you can help to keep your dog happy and healthy by visiting the vet regularly and ensuring your dog lives a healthy, active lifestyle. Do you have a Schnug to snuggle with? What lead you to this unlikely-looking crossbreed? Do you think we’ve done them justice in this article? Oechtering, T. H., Oechtering, G. U., & Nöller, C. Structural characteristics of the nose in brachycephalic dog breeds analysed by computed tomography. Tierärztliche Praxis Kleintiere. 2007. We have a 16 month old named Xena. She is a darling little dog who thinks she is a human. She bark talks to us all time. We just love her. She started out black with a small amount of white on her chest. She now has a small amount of tan and her legs have lots of grey wavy hair. She is a good mix of Pug and Schnauzer. My little Schnug,Auggie, is the live of my life! He is friendly with everyone,LOVES to play fetch, is very affectionate and is very smart! I would agree with the article except he is even friendly with strangers. Although he is now 6yrs old he really (knock wood) hasn’t had any health issues. He loves to run and also play hide and seek with his toys? Our beloved Schnug of 14 years “Sable” died the 4th of July of a myocardial . We are a retired elderly couple and really miss the companionship..Feels like our hearts are going to break. If you or anyone else knows of Schnug puppy, please let us know. My wife has raised numerous dogs and cats from birth. We are on a fixed income and don’t have a lot of money to throw around , but we dearly miss our Sable……………..